While primarily a publisher of some of the most engaging new works in the comics form, Drawn & Quarterly also delves occasionally into reclamation projects, introducing contemporary North American readers to out-of-prints Japanese gems. While my knowledge of is limited—Katsuhiro Otomo’s 80s Akira and Naoki Urasawa and Osamu Tezuka’s early 21st century Pluto are the current manga titles on my shelf—I was delighted when D&Q re-released Yoshihiro Tatsumi’s The Push Man and Other Stories, a set of 1969 manga that are so un-manga in tone and subject matter that the author coined his own term (gekiga) to differentiate his slice-of-life, working class realism from the fantasy and science fiction norms of the medium. 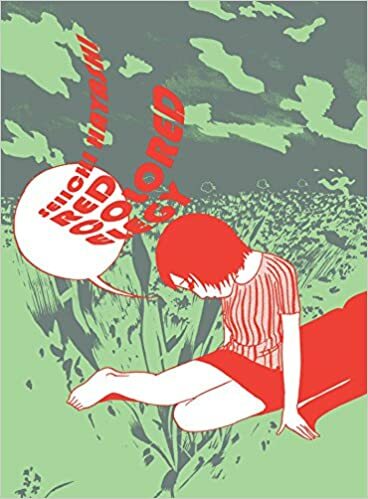 Earlier this year D&Q re-released another un-manga manga classic, Seiichi Hayashi’s Red Colored Elegy. Originally serialized in Garo magazine in 1970, Hayashi documents roughly the same historic moment as well as the same urban setting of Tokyo. Both authors also center their narratives within the intimate spaces of taboo romantic relationships. But despite similarities, no reader could mistake the two works. Tatsumi’s naturalism provides detailed backgrounds and consistently rendered figural characters. Preferring an idiosyncratic style of cartoon impressionism, Hayashi leaves his panels sparse and gives his characters simple, anatomically peculiar shapes that can shift according to situation. Where Adrian Tomine supplied the introductory material for Tatsumi (in the form of a literal Introduction as well as a brief interview with the creator in an afterword), D&Q appends Red Colored Elegy with an expansive, context-clarifying essay by Ryan Holmberg, detailing not only Hayashi’s animation career (working for the “Disney of Asia” on the TV series Wolf Boy Ken for example) but also the graphic novel’s subgenre of the anti-marriage romance (translating roughly as “cohabitation,” though I sense the connotation would be closer to “living in sin”) as well as the novel’s impact on Japanese 70s counter culture (spawning a “theme song” single, a film, a TV show, and numerous manga imitations). While none of this material is necessary to appreciate the novel, all of it is informative and some of it is usefully revealing, since Holmberg’s expansiveness is the inverse of Hayashi’s visual and narrative style. The literal absence of backgrounds (figures stroll across white nothingness or stretch across a floor implied only by their posture) extends to the storytelling approach. No narrated caption boxes or in-scene signage identifies locations as the main character Ichiro (who shares several biographical facts with his creator) vacillates between his job at an animation studio and the apartment he shares with his girlfriend, Sachiko. 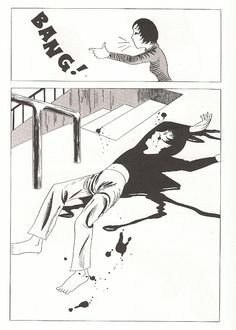 Instead of establishing the mundane details of setting, Hayashi opens the graphic novel with a headless, inkwell-necked version of the Disney character Goofy expressing Ichiro’s (who goes unnamed) discontent with his studio job until Ichiro turns and punches him in an explosion of ink. Hayashi introduces Sachiko’s conflict with her family even more cryptically: a woman’s face literally featureless but for her black tears, an older man’s silhouetted head beside an empty talk balloon. The images—and a dozen like them—establish the emotion of the scene without providing the initiating content that a 1970 Garo reader would have understood from cultural context: her parents are distraught that their unmarried daughter has moved in with her boyfriend. That trauma and continuing premise may seem quaint a half century later, but it is the core of the novel, as the two lovers struggle through their relationship and their attempts to succeed as individual artists. Appropriately, Hayashi renders those struggles through sometimes obscure, but always evocative imagery. Though, like almost any other comics artist, he draws his characters acting and speaking in particular scenes, a sequence may be interrupted at any moment by a purely impressionistic element, as when the two lovers are about to embrace but are then replaced in the next panel by Snow White scooped into the arms of her Prince. The image reverberates with its pop cultural connotation of happily-ever-after while simultaneously casting doubt that the real-world Ichiro and Sachiko will ever find such effortless closure. The effect is intensified by the Disney characters’ partial resemblance to the two lovers, a departure from Hayashi’s typical style, as if Ichiro and Sachiko are caught between worlds and genres. Raindrops and lightning often erupt at key moments too, signifying not the pathetic fallacy of an exterior world in sync with characters’ turbulent emotions but pure symbolism since the absence of backgrounds disguises the fact that the scenes are nominally interior. Also, despite his minimalistic style, Hayashi occasionally breaks into an isolated, visual flourish of detail in a photo-based face or crumpled cigarette pack or telephone pole or electric fan, further destabilizing the story world. This is not simply the story of two struggling artist-lovers, but an interrogation of the artistic norms for visual storytelling in general. Later, after suffering each other’s absences, betrayals, and violence, Ichiro and Sachiko are replaced not by Snow White and her Prince but King Kong and Godzilla. When Ichiro suggests they break up, Sachiko holds up her fingers like a gun and exclaims: “BANG!” Ichiro sprawls bloody and dead in the next panel—though he ends the novel alive and rolling on the floor of his empty apartment in self-pity. The melodrama is well-suited to the material, as if the actual events are distant, and these images and jagged juxtapositions are just their distilled adaptation. There is little else in the comics world quite like them.